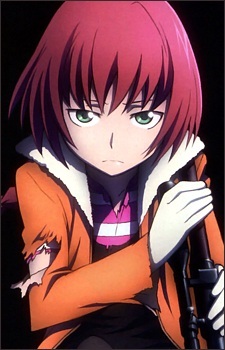 Age: 13 The main female protagonist. A girl who lives in Vladivostok, Russia. In the Gemini of the Meteor story arc, Suou becomes involved in the war and machinations between the various groups and Contractors, and her life is forever changed when she meets Hei. She is Eurasian, with a Japanese mother and Russian father. She also has a twin brother, Shion, who uses a wheelchair. She is later revealed to have some form of contractor ability when she goes into mental shock, which awakens her latent powers. Her exact Contractor ability is not explicitly known, but with it, she is able to manifest an PTRD-41 from the meteor fragment she wears. Suou wields the rifle with ease and skill, though whether this is also part of her Contractor ability or not is unknown. Her remuneration involves folding paper into origami, though it is not known if her remuneration is folding origami. It is later revealed that Suou was a copy that was made from her brother's ability. The real Suou had died when she was 5 years old at the University her parents were at. She also develops feelings for Hei later on.